...but every area throughout the game added a new gameplay mechanic? It's worth finishing for the conclusion of the story/delivery of the message, in my opinion. I couldn't finish it as it just wouldn't let me continue on, that the PS4 version is right on my radar. Anyone else pick this up on PS4, I started this evening but I want to finish Until Dawn first before giving this my attention but from what I played it looks gorgeous. It'll be an in the future kinda thing for me. I liked the Vita one but I've not even platted it, so no rush to upgrade. 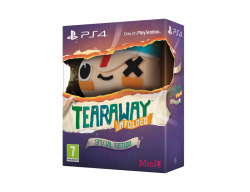 Have been playing some Tearaway Unfolded on PS4 and I love it! Definitely echo the "feels like a Nintendo game" comments earlier in this thread. Is there a thread for them? Feel like there are quite a few dotted around, particularly with indie games now. I think why so many indies feel like Nintendo game or trying to be like a game on a NES or SNES and even N64 now, is because if you're around my age and a game dev I guess you may want to make something similar to what you liked. Always thought Overwatch felt sort of Nintendo like if they made a FPS. I really enjoyed this at first but felt a bit bored of it by the end, as if it out stayed it's welcome, hopefully it's not the same for you though. It definitely has it's Nintendo like charm though, much like LittleBig Planet before it, it all feels quite wholesome.